How often do we forget to fully thrust ourselves into our tasks? How often do we idly complete tasks mindlessly without a sense of purpose? In this short film, the premise revolves around a chef prepares a meal in a room filled with microphones. The film employs sound as it definitive driving force in order to utilize the sensory elements of an ideology called mindfulness. The idea of mindfulness is about fully thrusting oneself into whatever they're doing. It's about freeing the mind of outside forces that may attempt to disrupt a state of peacefulness that is created from taking a hold of the way a person thinks. When we watch a film, we have many different sensory elements working at once, such as sight, sound and touch. Though we have a visual aid of the chef preparing the meal, it is often disrupted by, proving that what we're really meant to do is sit back and enjoy the sounds we hear consistently throughout the film. And we are to do so without letting any distractions get to us, including ourselves, or else we're to subjected to becoming like the mindless robot that he feeds at the end of the film. Though The Bridge masks itself as an exploitative expose on the "construction and aesthetic appeal" of the Brooklyn Bridge, what it really seems to be doing is highlighting the appeal of everyday humanity. 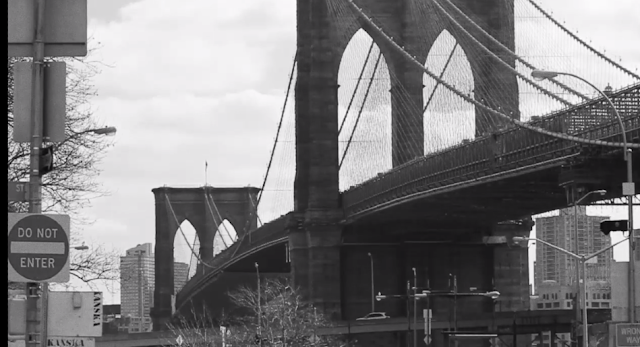 Though the bridge stands out at the centerpiece of Brooklyn, the more prominent elements of the film are the people who use the bridge, how quickly they move about it and whatever they're using it for. Buses, trains, boats and people just wandering around fill the screen and although the narrator touches primarily on the concept of building bridges, by watching, what you're beginning to understand is the fast-paced nature of Brooklyn's residents and the bridge they use to get around to do what they need to do.